Heat oven to 350°F. Spray 13x9-inch (3-quart) glass baking dish with cooking spray. In medium bowl, mix Alfredo sauce and milk; spread 1 cup mixture in baking dish. Sprinkle chicken tenders with garlic salt. 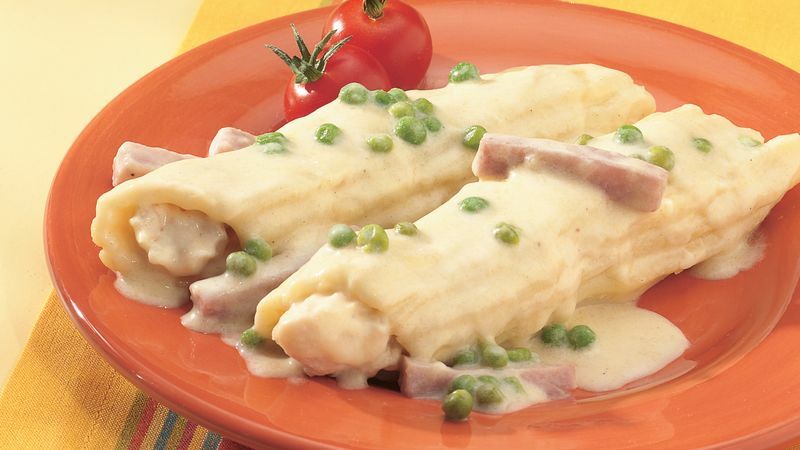 Fill each uncooked manicotti with chicken, stuffing into each end; place stuffed manicotti in baking dish. Reserve 1/2 cup sauce mixture for topping; pour remaining 3 1/2 cups sauce mixture over manicotti. Cover tightly with foil. Bake 1 1/4 hours. Meanwhile, in medium bowl, mix reserved 1/2 cup sauce mixture, the cheese, peas and ham. Remove baking dish from oven. Uncover; pour sauce mixture over manicotti. Return to oven; bake uncovered 15 to 20 minutes longer or until cheese is melted. Let stand 10 minutes before serving.